Tomato, Sugar, Modified Food Starch, Iodised Salt, Palm Fat, Maltodextrin, Onion, Spices, Citric Acid. All food additives are of plant origin. May contain traces of cereals containing gluten, milk, egg, fish, crustacean, mollusc, soy, peanut and tree nuts. 1. 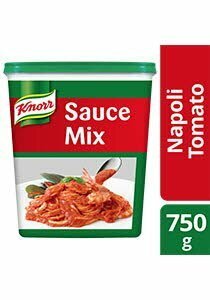 Dissolve 180g of Knorr Napoli Tomato Sauce Mix in 1 litre of room temperature water. 3. Use cooked sauce as it is, or as a pour over sauce for pasta, meat or vegetables.